Not having opposable thumbs can be frustrating—just ask your dog or cat! That means unless you brush your pet’s teeth regularly or you’ve rigged up some fancy, paws-free brushing and flossing station at your house, your pet goes months or years without cleaning their teeth. No surprise that by age three, 80% of dogs and 70% of cats have some evidence of periodontal disease. This condition can significantly impact a pet’s quality of life, causing mouth pain, tooth loss, and at advanced stages, serious illness. 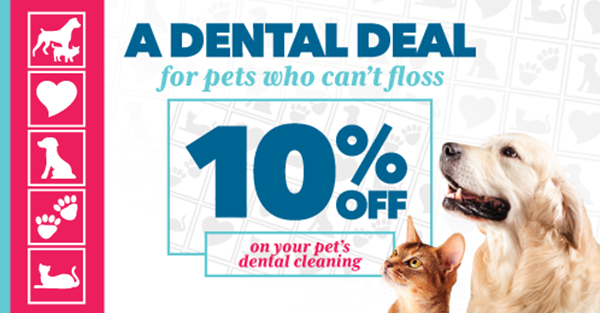 That’s why through the month of February, Crossroads Animal Hospital is offering 10% off your pet’s dental cleaning! We believe regular dental care for pets is extremely important, and we want to help you get your pet started on the road to good oral health. When you bring your pet in for a dental exam prior to cleaning, our veterinarians will also be happy to show you how to brush your pet’s teeth, which is the best way to avoid serious dental problems down the road. If your pet won’t tolerate brushing, the vet can advise you on chews and other products that help reduce plaque and tartar build-up. But it all starts with an exam and cleaning! Spots will fill up fast—call us at 540-288-4683 for details and to schedule your pet’s spot today.